Award Winning Web Site Designs - A review in The State newspaper! 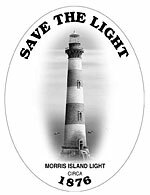 Savethelight.org was created by Save The Light Inc., a band of souls dedicated to preserving the historic Morris Island Lighthouse at the mouth of Charleston Harbor. The 158-foot lighthouse operated from 1876 to about 1962 when a new lighthouse replaced it on nearby Sullivan's Island. The Coast Guard wanted to tear down the old tower, but it didn't count on local preservationists who were convinced it was worth keeping. The web site is part of Save The Light Inc.'s effort to preserve the tower as a publicly owned scenic site. The group has raised enough money to pay off the mortgage on the structure and recently the State Legislature set aside $500,000 to support the effort. But the tower, which survived the Charleston Earthquake and the ravages of Hurricane Hugo, is in rough condition due to neglect, vandalism and erosion. And, as the web site makes clear, more money is needed. Webmaster Bob Chapman has assembled a wealth of materials on the lighthouse and put them online in a quality site that rivals some of the best commercial efforts. You can use your computer can take a virtual tour of the lighthouse accompanied with the sound of surf breaking in the background. Connect to streaming video for a 360-degree view from the top of the tower. There are dozens of contemporary color photos of the tower and its surrounding plus a Back in Time Tour page of black and white images. A links page has connections to a dozen or more other web sites with information on Morris Lighthouse or other lighthouses. Particularly interesting are links to web cams at the site of the Cape Hatteras light that was relocated this summer. Another standout page contains aerial photos of state lighthouses that were used as a reference for artists interested in entering the S.C. Duck Stamp Contest. Click on any of the photos and the site loads an image of the duck stamp that it inspired. Speaking of photos, I wish Webmaster Chapman would consider resizing some of the great shots of the tower and making them available for downloading as full-screen wallpaper. I think many would-be contributors would appreciate it. Bill Hughes is managing editor of thestate.com, The State newspaper's web site. He'd like to hear from others about interesting web sites they've found with a South Carolina perspective. He can be reached at 803-771-8525 or bhughes@thestate.com.